Looking for a fun way to teach metric measurement conversions? I hand my students a cup of chocolate milk and have them hop like a kangaroo around the room before giving them this handout. 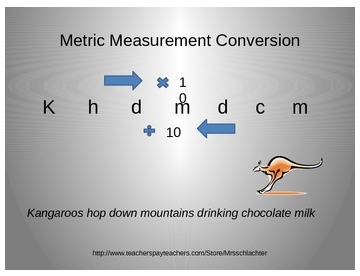 They easily convert metric measurement by "hopping" by tens. Note: Three "hops" is not equivalent to multiply by 30...it would mean multiply by 10 by 10 by 10.